With that said, and because April is National Sjogren’s Syndrome Awareness month and in keeping with the “Women’s Health” series I started some time ago, I would like to share with you a little about my experience and a little helpful, informative information about Sjogren’s. The shear number of Sjogren’s sufferers makes it one of the most prevalent autoimmune disorders, but I can imagine when you read the words “Sjogren’s Syndrome” your first reaction was probably, “What the heck is that?” That is a typical response of most people because they are more familiar with autoimmune diseases like lupus, scleroderma, Rheumatoid Arthritis and diabetes. Although symptoms of Sjogren’s were identified as early as the late 1800’s, in 1933 Dr. Henrik Sjögren was the first physician to identify the illness. Because of his “discovery” the illness bears his name. Now, keep in mind an autoimmune disorder or disease occurs when a person’s body is attacking itself and killing itself or parts of the body. This is called an overactive immune response. In simple terms that means in say the case of lupus, a person’s body may read the body’s liver as an unwanted and dangerous foreign substance. The body will then send “agents” of some type to the unwanted “item” or area for the purpose 0f eradicating or ridding the body of the perceived danger. When that happens, the body and the areas in the body affected are damaged and/or diseased…sometimes terminally. About 79% of the people affected by autoimmune disorders are women. Combine that with the rate of incidence of Sjogren’s among female patients and you can see autoimmune disorders are a predominantly female problem. Yes, men can and do develop autoimmune disorders, but just not at the rate women do. Not to make light of the situation, but one of the hallmarks symptoms of Sjogren’s is dryness, particularly dry eyes and dry mouth (again, “How Dry I Am…”). But, don’t be deceived or mislead…Sjogren’s can be a very debilitating illness to live with causing far more than “just dry eyes and dry mouth”. Dry eyes – this can lead to ulcers on the eyes, infections and blurred vision. Sometimes “dry eyes” result in a gritty feeling…like someone has kicked sand in your eyes. In some cases, the eyelid may actually stick to the eyeball. Oddly enough, dry eyes can lead to excessive tearing. Why? Well, the tear film that covers the eye has three major components: water, an oily layer and mucus. The natural oils in the tear film enable the film to cover the eye and protect it. As the film breaks down, holes begin to form in the film, resulting in the dry eye. The tear ducts go into overdrive producing water, i.e. tears, to try and make up for the other missing components. Sadly, this doesn’t work because the proper ratio of all components is absent and the eyes remain dry. Of course, then there are the times when tears are totally absent…even if you are crying! Believe me, that’s a most frustrating situation…to be angst enough to cry, but your body is unable to produce tears. Fatigue…many times patients are overwhelmed with life altering, debilitating fatigue. Symptoms and complications can be life changing and debilitating in many patients. My official diagnosis of Sjogren’s came in 1993. I had been exhibiting severe chronic fatigue, dry, gritty feeling eyes, joint pain and weakness, muscle weakness, and a chronic dry cough among other symptoms. My teeth were even being affected…I had crowns that just wouldn’t stay on and other issues. When I made the statement to an acquaintance my teeth were being affected, she suspected what my problem was…she was a Sjogren’s patient also. Many doctors were unable to diagnose the problem or simply overlooked important red flag warnings. I look back over the years since and I can see in hindsight how much my life has changed. It has been a life altering and sometimes overwhelming illness. I wish it was merely the “dry eyes, dry mouth” problem so many people assume it is. The doctor I’ve used since 1993 knew what to do after listening to me give my history and after examining me. He also knew enough to know blood work can sometimes be like smiling faces…they can lie…Blood work and/or tests are not always the best diagnostic tool. Many outside factors can affect the results of blood work. So, my Dr. X sent me to an oral surgeon for a lip biopsy. During the procedure a salivary gland was removed from my lower lip and sent to the university hospital pathology lab. The result came back and confirmed that yes, indeed, I have Sjogren’s. A lip biopsy is the most conducive way to determine Sjogren’s. I have never been what you would call a robustly healthy person…even as a child. Knowing what I know now, it almost seems like I was on a yellow brick road leading right to chronic health issues and autoimmune problems. I was told after one GI test and a turn in the hospital that I had a very sluggish GI system…as a matter of fact, the slowest one they had ever seen. Ya think?! My research on Sjogren’s has revealed this could be because of the lack of sufficient moisture, thus resulting in slow motility of the GI system. In addition I’ve been diagnosed with Irritable Bowl Syndrome (IBS or IBD), spastic colon and esophagus, colitis, and acid reflux. When I was first diagnosed my rheumatologist sent me to an ophthalmologist who examined and tested my eyes by measuring the moisture level and looking at my eyeballs in a Slit Lamp exam. At that time, in 1993, the ophthalmologist determined my eyes were affected. He had used the Schirmer exam to measure the moisture in my eyes. (I have been told since the Schirmer exam is not used as universally as it once was and other techniques are used.) Based on the scale of 0 to 15 with 15 being the moistest, I was informed my level was about 3. Wow! No wonder I was walking around feeling like I’d had a whole sandbox kicked in my eyes! By using sterile eye drops or “tears” I was able to raise the moisture level in my eyes for a while to 6. Since autoimmune disorders can have a degenerative effect on the body and its parts, that was not to last long. To keep moist eyes over the years has been a struggle. To maintain any moisture in my eyes I have to use the sterile eye drops or “tears” several times a day and during really bad flare ups a lubricating ointment. Although the ointment is called a “night time” application, my eyes are so dry that on occasion day time usage is needed. GenTeal makes a gel drop that is for moderate to severe dryness. Since it’s a little more viscous than other drops, it gives me more relief than a standard eye drop does. A Sjogren’s patient is advised to visit the ophthalmologist every three months. In many cases uninformed and restrictive medical insurance company policies and cost make this prohibitive for the patient. Over the years I have seen a daily decline and degeneration of my health. No matter how fastidious I am about dental hygiene, I battle tooth decay and dental issues. When my mouth becomes extremely dry I develop painful sore in the angles of my mouth. Many times this can be caused by oral yeast (thrush). To battle that I use a concoction called “Magic Mouthwash” made up of ingredients like nystatin, lidocaine, an antihistamine and sometime something like Mylanta. My mouth stays so dry that I am seldom without something to drink right by my side. Over the years my devoted canine companions have learn if Momma picks up the “big glass”…then she’s on the move. They hop up ready to follow me where ever I go. As far as glandular problems…around October 2006 I was finally diagnosed with hypothyroidism…something I was not surprised about. I had suspected it for years and exhibited many symptoms. I have a parotid gland that seems to stay swollen and besides the other various smaller (and uncomfortable issues), I am a two time non-smoking lung cancer survivor. In 1982 a tumor and a portion of the lower lobe of my right lung was removed. I was cancer free until 1995 when I went through another bout with lung cancer. This bout resulted in 60% of my left lung being removed. Sjogren’s can affect a person’s lungs, but did Sjogren’s cause my lung cancer? The lungs are one of the many internal organs Sjogren’s can affect…but, cancer? No one has any earthly idea why a non-smoker like me has gone through two bouts of lung cancer. I had no risk factors per say…no extensive exposure to second hand smoke…had not lived with a smoker…but I do have those pesky autoimmune disorders. I would say in my case, the fatigue and joint pain has been as severe or more severe as the dryness. Combined with Fibromyalgia and chronic fatigue syndrome and you can understand why some days I feel too tired to even breathe. There is no cure for any autoimmune illness…Sjogren’s included. There is no “magic pill” either. In handling Sjogren’s, as with other autoimmune illness, the best you can hope for is management of the disease or a slowing of the disease. This is done by learning to pace yourself…learning to say “No”, making some lifestyle changes, good doctors, and yes the use of over the counter and prescriptions drugs. I mentioned earlier the use of artificial tears for the dry eyes. For the oral dryness there are medications, like Salagen. There are several other products on the market to help with oral complications of Sjogren’s. You may have to take pain medication for the joint pain, avoid situations that will aggravate your dryness, address complications and practice good nutrition and proper rest. In some cases you may have to take a disease modifying medication like Plaquenil, Enbrel or Methotrexate. I have been on Methotrexate for over a year now, but like all drugs in this category it comes with serious possible side effects. Yes, I know this all may sounds dismal, but it doesn’t have to be. Supportive friends and family can be a lifesaver, so make sure they are informed about you disease. Learn to love the current you. It was very hard to accept myself and what was happening to me at first. I felt like I was loosing myself to a strange, unbeatable disease. As a result, I pushed myself in way I probably shouldn’t have resulting in unhealthily stress and strain. Over the years I have found things I enjoy doing. They help validate who I am. This is a God-send for self confidence and self worth. Many of my most enjoyable pastimes can be done sitting under the covers of my bed. I read, stay connected to the world via the internet and the laptop my Tall & Handsome made sure I got. I can quilt for small amount of times and with rests. I’m a computer gamer (MMORPG’s) and of course, I can write. 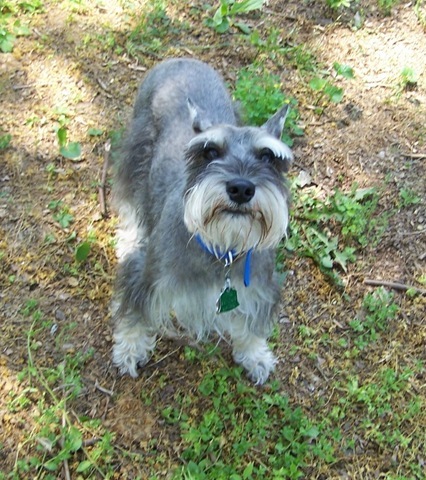 T & H also brought home a little four legged, practically hypo-allergic companion…our little Miniature Schnauzer Watson the wonder dog, and in my opinion one of the best little mood lifters there is. Nothing warms my insides like those two little eyes looking at me adoringly. Would this cheer you and comfort you if you were sick? You betcha!! So, if you suspect Sjogren’s or any other autoimmune illness, get to your doctor as soon as you can. Starting a proper health care and management regime can turn “How Dry I Am…” into “How Strong I Am…I’m a Survivor…”! © 2009 Beverly Hicks Burch All Rights Reserved. This was wonderful and informative to read. I’m currently awaiting my blood test to see if I have Sjorgen’s because my endocrinoloigst seems to think I do. I have odd symptoms, actually, I’ve had odd symptoms for years but they have just recently gotten worse. My balance can be off at times (I lean or fall to the left), my vision has been blurry, I often feel dizzy (out of nowhere), my skin is itchy and sometimes feels like it’s ‘burning.’ I am now experiencing dry mouth, with raw-type soreness in the corners of my mouth. My eyes don’t feel dry, but have a burning, or stinging sensation. The right side of my face, just along the jawline, will tingle or feel numb. I got sudden feelings of being tired or just fatigue. I’ve even had a ‘glaze’ look come over my eyes. I was diagnosed with Hashimoto’s thyroiditis at least 8 years ago, and now I’ve been dealing with these symptoms for quite some time. Are there any symptoms I described that you might also have experienced? You’re wonderful informative and very positive and upbeat, all things and symptoms considered. T, thanks for stopping by and commenting. Do the things you describe sound familiar? Well, if I said “Have you been following me around?” Would that answer your question? LOL! Yes, yes, yes and yes. Oh my, yes! The dizziness, the balance problems, the numbness and tingling and the itchy skin. My dear, they all have been constant companions of mine for years. The itchiness got a little better after my thyroid problem (hypothyroidism) was addressed, but I still have flare ups that feel like someone has dipped me in itching powder. One thing to consider is fibromyalgia. I also have fibromyalgia (FMS) and from some of the research I’ve done, some people with FMS deal with itchiness. As I mentioned in the original blog, autoimmune disorders tend to cluster…meaning it you have one, there’s a better than good chance you’ll have another. Also, they tend to cluster in families. This is so true in my family. The numbness and tingling can be neuralgia and/or neuropathy. I’ve dealt with both…the first in my head and the latter in my right leg. The numbness and tingling in my head started at the back of my head, crept over the top of my head and reach down the front of my head. At times it felt like little bugs were crawling all over my head…and then my nose and mouth would go numb. The neuropathy in my leg in constant…and painful. It started out as a small spot and has now spread to cover almost my whole outer thigh. The fatigue, balance issues, dizziness and vision problems…it ALL is sooooo familiar. My fatigue is debilitating most of the time. Keep in mind that dry eyes presents itself in several ways…and what you mentioned are classic. Also, it seems that Hasimoto’s and Sjogren’s can be synonymous. Finally, I would also direct you to the National Sjogren’s Association. They have excellent up to date information including publications and are strong advocate for awareness of Sjogren’s and Sjogren’s patients. T, good luck and God speed. Check back in and let me know how you are doing. Oh Wendy! I’m so sorry and can truly empathize. My teeth have dealt me fits for years…since 1993 and was one of the way I knew something was wrong with me. I have always taken good care of my teeth, but things were still going haywire in the dental department. As far as suggestions…Wendy, check and see if there are any local dental schools in your area. Sometimes they will take patients from the general public for there dental students to practice there knowledge on. I have used this option many years ago and it wasn’t too bad. I’ve read about other people doing this on a routine basis. Also check with the Sjogren’s Syndrome foundation and see if they can guide you in the right direction. Good luck!! Let me know how it turns out.